Panama City officials are expecting the new marina development, which moved into the planning stage this year, to be the catalyst the area has needed to move into a new era. EDITOR’S NOTE: This story ranked No. 4 in a News Herald editorial poll of 2016’s top stories. This series will continue through Jan. 1 and online at newsherald.com. PANAMA CITY – Little by little, Panama City leaders have laid the groundwork this year for the revival of Panama City’s downtown. Panama City officials are expecting the new marina development, which moved into the planning stage this year, to be the catalyst the area long has needed to advance into a new era. “This (project) releases the potential of downtown,” Mayor Greg Brudnicki said in August after tentative design plans were first unveiled. Riding the unrealized potential, nearly a half-dozen other projects were launched in 2016, ranging from the creation of apartments, to business investments, to other beautification efforts. Community leaders are hoping the domino effect of projects will build a “live, work, play” environment in the downtown, perhaps best summed up the Downtown Improvement Board (DIB) brand promise released this fall. Their vision pledges to create “walkable community that provides urban loft living, authentic experiences and access to recreation” as well as places to work and a view of the bay. All through the year, Panama City residents were offered a taste of what could come for the downtown as design plans trickled out. 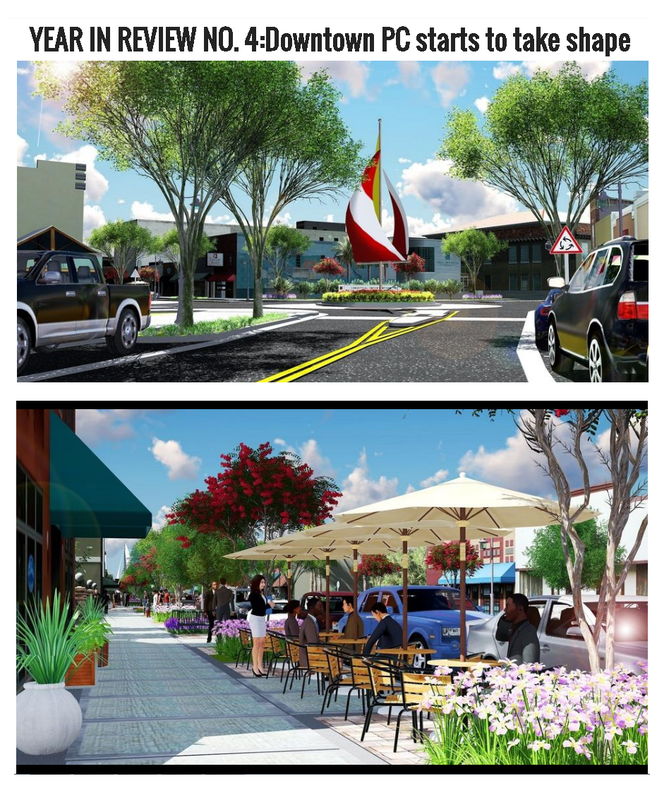 In April, they received their first taste of the immediate future for the downtown when the Community Redevelopment Agency (CRA) released a video of the redesigned Harrison streetscape, with parallel parking, new landscaping, a roundabout and much wider sidewalks to accommodate outdoor shopping and dining. While plans to start construction this year fell through, CRA Director Jared Jones said work will start next year. In the meantime, he and his staff are tweaking the designs, including looking at whether any palm trees will stay. The biggest proposed changes, however, came in August when Sonnenblick Development released a proposal for $200 million worth of construction on the marina. The plans have since gone through several iterations as things have been deleted and added as part of an ongoing back and forth between the City Commission and developer. The latest designs, released in late December, emphasize entertainment, fishing and cultural opportunities, and maintain the signature lighthouse first proposed. Construction is a ways away, but the plans should take a solid form in 2017. The business side of the downtown saw a boost this year as store owners, quasi-government agencies and even the police departments started to change the culture. For years local officials have said their needs downtown are living spaces and jobs, and those pieces finally started to fall into place. Several store owners turned the space above their business into apartments with instant success, and Jellyfish Health, a health-care technology company, moved into a larger downtown building on Oak Street – they already had a smaller presence on Harrison – with the promise to add 100 high-paying jobs in the next two years. Government spent the year working to bolster these efforts. The police stepped up to more aggressively police vagrancy in the downtown at the request of business owners. Destination Panama City worked to market the shops – as well as the rest of the city – to outside markets, such as Atlanta, Baltimore and Nashville, Tennessee, even landing several restaurants in the pages of USA Today. The city bought the Trustmark Bank building in the heart of the downtown with promises to add foot traffic, vibrancy and more importantly parking. All of this planning, officials said, poises the downtown area for a strong 2017. The mayor put it even more simply.